How does this help the church? All proceeds from Egg Sunday go directly to the church to help support next year’s budget. The DeCloux’s have been making this contribution since 1997. It’s simple: sign up in the Chapel! The prices below are for delivery once a month, November through October. 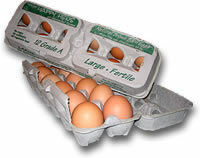 Eggs are delivered to the Chapel for pickup after church. All are welcome, so sign up today! Mid-year sign-ups are welcome, and will be pro-rated.